Not to be confused with Little Chalky Island. For other places with the same name, see Chalky Island. 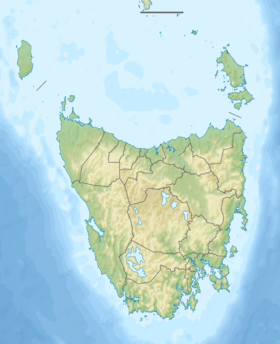 The Chalky Island, part of the Big Green Group within the Furneaux Group, is a 41-hectare (100-acre) unpopulated granite island with limestone outcrops and dolerite dykes, located in the Bass Strait, west of the Flinders Island, in Tasmania, in south-eastern Australia. The island is contained within a conservation area and is part of the Chalky, Big Green and Badger Island Groups Important Bird Area. Recorded breeding seabird and wader species are little penguin, short-tailed shearwater, white-faced storm petrel, Pacific gull, silver gull, sooty oystercatcher, pied oystercatcher, black-faced cormorant, Caspian tern and fairy tern. Reptiles present include the metallic Skink, White's skink, white-lipped snake and tiger snake. ^ "Chalky Island (TAS)". Gazetteer of Australia online. Geoscience Australia, Australian Government. ^ "IBA: Chalky, Big Green and Badger Island Groups". Birdata. Birds Australia. Archived from the original on 6 July 2011. Retrieved 14 June 2011. This page was last edited on 19 November 2018, at 18:57 (UTC).